Leisurely Dells Boat Tours and amphibious Original Wisconsin Ducks, offer a variety of ways for visitors to see the colorful fall landscape. 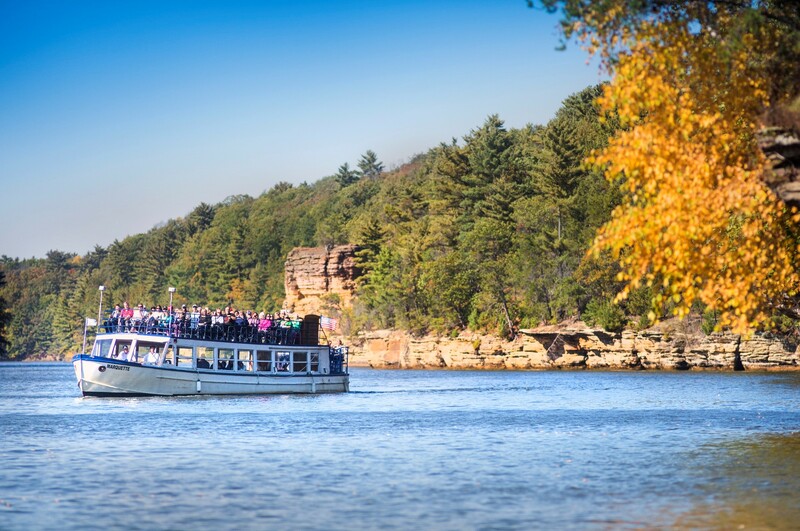 Dells Boat Tours offers cruises thorughout fall; a great way to see the changing canopy of color in Wisconsin Dells. Warm fall days and crisp cool nights are the perfect combination to bring out nature’s bounty of fall color. As the autumn season emerges in Wisconsin Dells, the changing landscape along the Wisconsin River comes alive. Colorful trees, with hues of yellows, orange and red, line the scenic sandstone bluffs along the river flowing through the Dells. One of the best ways to take in the spectacular scenery is by way of Dells Boat Tours. 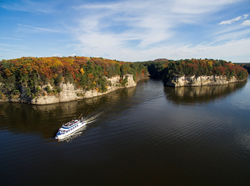 “Fall is one of the most beautiful times to enjoy a relaxing cruise on the Wisconsin River to see nature’s last hurrah before the leaves begin to fall,” said Amanda McGowan, assistant manager of Dells Boat Tours. Daily river excursions run through October 28, giving visitors plenty of time to see the changing landscape of color in Wisconsin Dells. Boat tours generally depart hourly from 10:30 a.m. to 4:00 p.m. during the week, with boats leaving every half-hour during the busy fall weekends. Visitors should call (608) 254-8555 for departure times or visit http://www.dellsboats.com for tickets and additional information. Peak color time in Wisconsin Dells is typically late-September to mid-October. 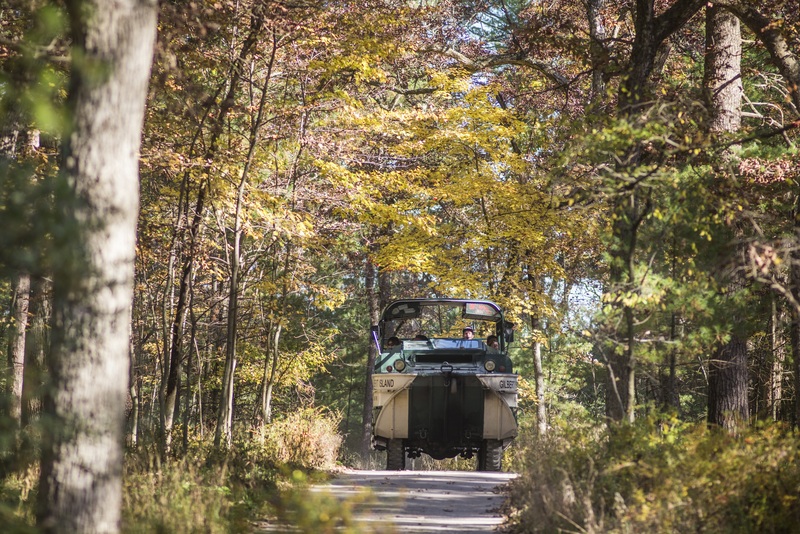 Visitors can take an adventurous journey through the colorful scenic trails along the Lower Dells aboard Original Wisconsin Ducks. Passengers travel along the quiet exclusive trail system surrounded by the beautiful canopy of color, all aboard an open-air Duck. The amphibious excursion splashes down into the Wisconsin River to see more of the region’s beautiful scenery. A second water entry goes into Lake Delton, the banks lined with stunning fall color, before coming back up on shore for more trail time on the one-hour round-trip adventure. Tours depart throughout the day this fall through October 28 from 9:00 a.m. to 4:30 p.m. Late fall season tours depart from 10:00 a.m. to 3:00 p.m. October 29 to November 11. Call (608) 254-8751 or visit http://www.wisconsinducktours.com. For those who are more daring, Dells Ghost Boat takes on a Halloween flair each fall. Ghost Boat: Season of the Witch ventures out on Friday and Saturday nights in September and October, traveling upriver to a creepy dark canyon. The crisp fall air sets the stage as passengers settle in for an after-dark 1½-hour excursion upriver. Stories of the Dells’ ominous past fill the air as the boat navigates the dark, rushing waters of the Wisconsin river. Anticipation builds, as the boat makes its way to Cold Water Canyon. Docking at the eerie gorge, passengers leave the safety of the boat behind and walk on foot. The bluffs hug you in and darkness is all around; it’s unknown who or what may be around the next bend or lurking in the shadows. Ghost Boat: Season of the Witch generally runs Friday and Saturday nights in September and October. Advanced tickets are highly recommended. Ghost Boat tickets can be purchased online at http://www.dellsghostboat.com. For information call (608) 254-8555. Fall visitors can let their natural curiosity take charge and learn about the world in which we live at the Tommy Bartlett Exploratory in Wisconsin Dells. The Interactive Science Center features more than 175 hands-on exhibits exploring science and technology, allowing families to sneak a little bit of learning into their fall getaway. The Exploratory has four sectors of activities that visitors can explore at their own pace. Some activities are simple brain-teaser puzzles or optical illusions that will keep you doing more than a double-take. 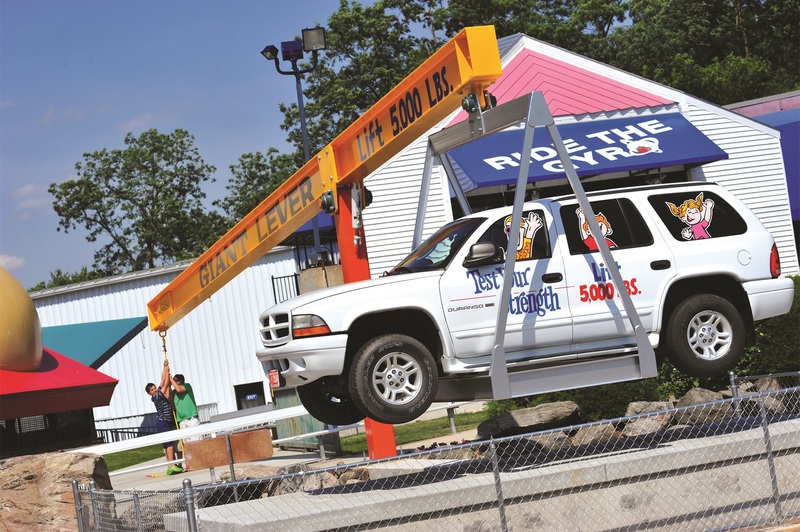 Others, such as the Giant Lever, get your whole body in on the experiment. The Exploratory also features a unique space sector dedicated to the marvels and milestones of space exploration. Open daily, year-round. Fall hours 10:00 a.m. to 4:00 pm. Call (608) 254-2525 or visit http://www.tommybartlett.com. Tommy Bartlett Exploratory offers hands-on fun with science. Fall tours are offered daily aboard Original Wisconsin Ducks along exclusive wilderness trails. 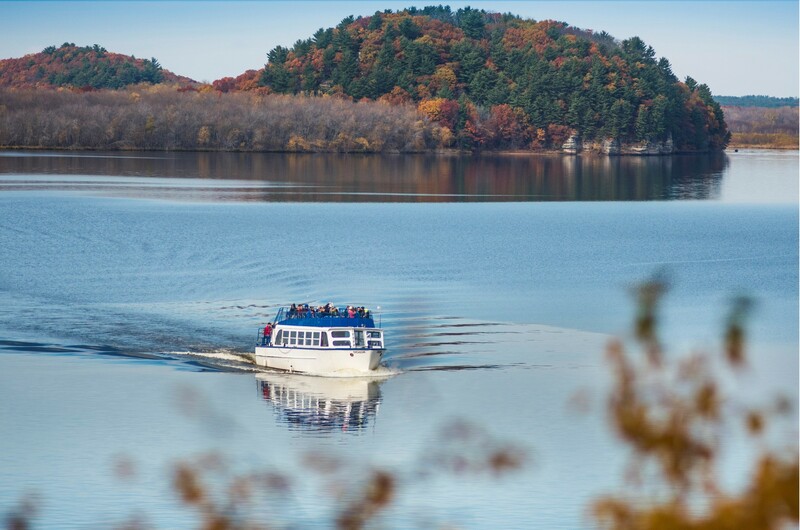 Original Wisconsin Ducks tours take passengers through the beautiful fall foliage before splashing down into the water. Clear fall days make for great viewing of fall color along the Wisconsin River in Wisconsin Dells. 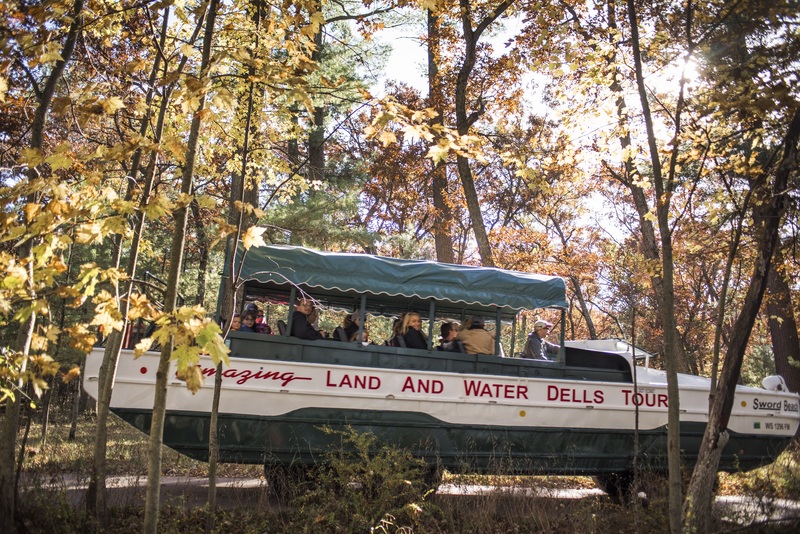 On a Dells Boat Tour is one of the best ways to take in the changing fall color.